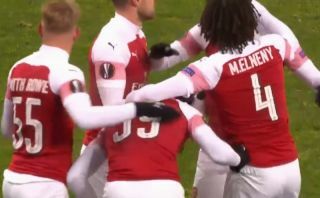 Arsenal youngster Joe Willock has just scored his first goal for the club this evening to make it 3-0 in the Gunners’ Europa League tie against Vorskla Poltava. The 19-year-old midfielder broke forward superbly before curling in a neat effort reminiscent of legendary forward Thierry Henry. Willock is one of a number of academy players being given a chance for Arsenal this evening, with Emile Smith Rowe also scoring in this match. The future certainly looks bright for the north Londoners, and this is a goal Willock will remember for a long time!